When my sweet friend, Hani, (Haniela's) approached me about a blog collaboration, I readily agreed. I think I may have mentioned before that she has been an inspiration to me for a long time! Hani also suggested Candy Crush as the theme, and though I have never played, I know it is wildly popular, and thought it was a great idea! We were both on the same wavelength with the color bombs:) Haniela's cookies are picture perfect! Check out her Candy Crush cookie post HERE. Due to their shape, brownie pops lend themselves to making great color bombs, especially with these jumbo rainbow sprinkles (Wilton)! 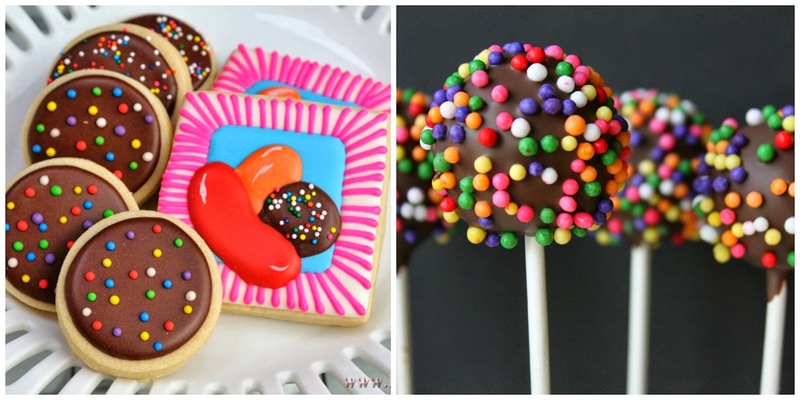 I like these brownie pops because they are easy, colorful and YUMMY! 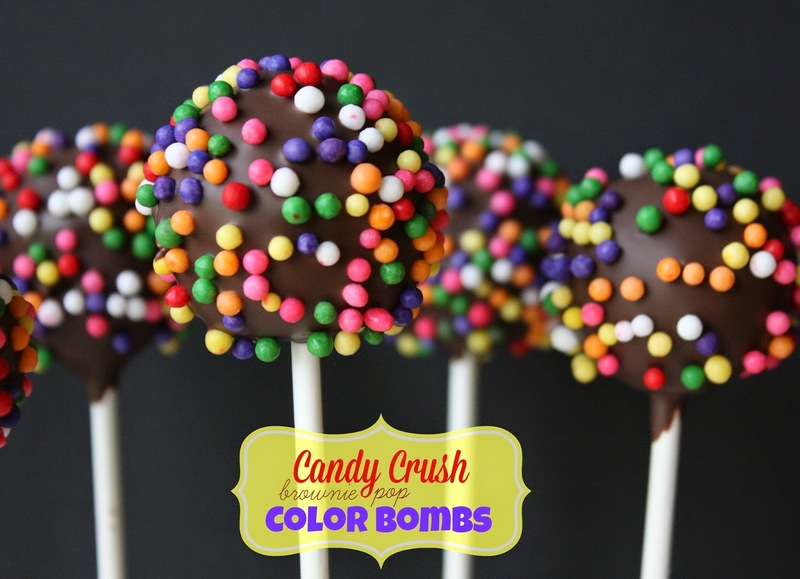 They'd be great for any Candy Crush fan, or party! 1. Bake brownies as directed, and cool completely. 2. Crumble up brownies in a big bowl and add a half a tub of chocolate frosting; blend well. 3. Form brownie mixture into balls (1.5-inches) and set on wax paper-lined baking sheet. 4. Melt the Candiquik according to package directions; dip each lollipop stick into the melted chocolate (about half-inch) and then insert one into each brownie ball. 5. Allow the brownie pops to chill in the refrigerator for about 10 minutes. 6. Did each brownie pop into the melted Candiquik, and allow the excess to drip off. 7. While still wet, add the jumbo sprinkles, holding the pop over wax paper. 8. Insert the lollipop stick in the styrofoam block to dry. Brownie pops, why am I only hearing about these now?!! They sound nom nom nom! Love you, love Hani, and love these sprinkle-y pops! These are so CUTE!! And brownies on a stick..YEAH BABY!! Haha, glad you like them, Lisa! Beautiful! Those rainbow sprinkles just make me happy! Glad you like them, Angie; thanks! You know I've never really made brownies, I've eaten them but I've never made them myself. These are so fun and I love that you use those bigger sprinkles, I didn't even see them out there. I need to get some of those. This is my kind of game ... one that has brownie pops and cookies! Both of your work is so fun! I love the brownie pops -- much better than cake pops. Such bursts of color! Thanks, Erin! Yep, brownie pops are pretty tasty! I love how perfectly uniform your beautiful treats always turn out. They are the perfect treat for any occasion and would surely put a smile on everyone's faces. I always make such tiny cakes for the party. It is so convenient for guests to eat them because no plates are needed and you can just sit or stand and enjoy the dessert. My little brother will love these! These are the cutest! A lot of kids and even grownups will love these!